The main thesis of this book is that the intellectual history of philosophy is philosophy; philosophy requires its own intellectual history to be philosophy; and ideas or philosophy are important in history. This thesis forms the matrix of the book, and how so, I illustrate in the following. Habermas, in a book I reviewed for this journal, The Lure of Technocracy (2015), put forward the very bold hypothesis that the restoration and development of humanism and liberalism, let alone the restoration of his own home school of political and social philosophy, the Frankfurt School of Critical Theory, depended upon the return of Jewish exiles, many even just to lecture, and some more permanently, to Europe. Moreover, on an even bolder historical note, Habermas said that German liberalism and humanism, though stemming in large part from Lessing and Kant, also stemmed from Heine, and Mendelssohn, as well as the Dutch-Portuguese Jew, Spinoza. In Habermas’s own words, ‘Jews have exhibited such an incomparable creativity in German philosophy since the days of Moses Mendelssohn that the proportional contributions of both sides [German and Jewish Enlightenment thinkers] to the objective mind are inseparably fused’ (106). I must note that Habermas attributed his attendance at a lecture by the returning Jewish theologian and social thinker, Martin Buber, to providing the incentive and theoretical background to Habermas’s own monumental contribution to the philosophy of rationality as communication. Habermas’s remembrance of Buber’s lecture verges on a religious numinous experience as well as an intellectual aha or eureka moment: ‘The entire auditorium rose to its feet in reverence when the President of Germany, Theodor Heuss, as if to underline the extraordinary nature of the visit, solemnly escorted the comparatively small figure of the white-haired and bearded old man, the sage from Israel, on the long passage past the row of windows to the podium […] This was how we had imagined the Old Testament prophets as children. In memory the entire evening contracts into this single dignified moment’ (121-2). Segue to the book currently under review. 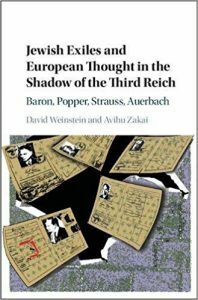 The book can be taken as an implicit, if not subconscious, case-study of the Habermas thesis that the restoration of liberalism and humanism in post-War, post-Holocaust Germany was due to the return of the Jewish exiles. The Habermas thesis, I could say if I were a Straussian (one of the four philosopher-intellectual historians studied in this book, i.e. Hans Baron, Karl Popper, Leo Strauss, and Erich Auerbach), is the intentionally hidden and secret core of the text. But why hide such a thesis? Is it hidden because the thesis is an extremely bold and readily falsifiable, if not actually false, hypothesis (to use the terminology of case-study, number two, Karl Popper)? Ironically, I suggest that the answer, to why hide the Habermas thesis lies in another book I happened to review in this journal, Richard Wolin’s, Heidegger’s Children: Hannah Arendt, Karl Löwith, Hans Jonas, and Herbert Marcuse. The “children” are Heidegger’s Jewish children, and one of them who Wolin does not not prominently discuss but only discusses as an afterthought in the New Preface, was Leo Strauss. Wolin’s thesis is that Heidegger’s Jewish disciples could not rid themselves of the fundamental principles of Heideggerian philosophy that is anti-liberal and anti-humanist. Heidegger copied Nietzsche in worshipping the mythology of the early Greeks and despised the birth of rational critical thinking in the teachings of the pre-Socratics and all philosophers onward. So, Strauss as a disciple of Heidegger implicitly imbibed Heidegger’s anti-liberalism and anti-humanism; and, thus not all Jewish exiles, including Emmanuel Levinas mentioned in Wolin’s New Preface, carried the books of Heine in their battered briefcases. Though Levinas (a prisoner of war rather than an exile), to be fair, was a hyper-humanist in his theory of the absolute and unconditional response to the needs or call of the Other. So, the very broad and bold thesis of Habermas, that the returning Jewish intellectuals from their exile outside Europe, restored liberalism and humanism, overlooks the anti-humanist threads, or at least, the elitist and irrationalist, under-tones of the neo-Heideggerian Jewish intellectuals. Perhaps Herbert Marcuse, another of Heidegger’s mamzers, subliminally admitted his own suppressed humanism as a former disciple of Heidegger, in his plea to Heidegger. Marcuse’s plea displayed disappointment with Heidegger’s failure to express contrition for Heidegger’s complicity with the Nazi terror and horror. Marcuse’s letter to Heidegger (as quoted by Wolin) reveals Marcuse’s suppressed liberalism and humanism: ‘…A philosopher can be deceived regarding political matters; in which case he will openly acknowledge his error. But he cannot be deceived about a regime that has killed millions of Jews—merely because they were Jews—that made terror into an everyday phenomenon, and that turned everything that pertains to the ideas of spirit, freedom, and truth into its bloody opposite.’ (167). So, is it false that all returning Jewish intellectuals and scholars came to restore liberalism and humanism to post-Nazi Germany and Europe? You would need a Freudian psychoanalyst of textual studies and of intellectual history to uncover the secretly coded messages of the former Jewish disciples of Heidegger. Here is where David Weinstein and Avihu Zakai, with their close studies of Baron, Popper, Strauss and Auerbach, enter the scene. Though they are not neo-Freudian, and though they advocate a variety of cultural and historical contextualism, they do expend special effort to decode Strauss. The other three are more straightforward and literal, whereas Strauss is purposely, so the authors argue, evasive and hidden in his message. Baron, Popper and Aeurbach are totally on a different track than Strauss who is the enigma of the book. It is a puzzle and a challenge to the open-minded, but critical reader why the enigmatic Strauss, apparently illiberal, authoritarian, elitist, neo-Heideggerian, is included. Understanding the puzzle of having Strauss in the book is key to understanding not only the book, but also the dilemma of the Jewish exiles. I elaborate in the following. The authors of Jewish Exiles argue that the exiled Jewish intellectual historians studied in their book—including Strauss, were liberal and humanist—to a tee. Specifically, how does Strauss compare to an avowed humanist such as Eric Auerbach, who the authors say: ‘From first to last, it [Auerbach’s magnum opus, Mimesis] was written against a time of utter callousness and values for those living and dead, who held fast to humanist culture and values.’ (258)? How does Strauss compare to the Jewish Renaissance scholar, Hans Baron, who became ‘obsessed with the early Italian Renaissance and civic humanism and republican liberty as a bulwark against tyranny and despotism’ (54)? How does Strauss compare to Karl Popper, a Jew only according the Nuremberg Laws of the Third Reich, public intellectual and technical philosopher well known mainly for his Logic of Scientific Discovery and his The Open Society and Its Enemies, but less well known for his other polymathic works. Popper’s own view of his Jewish identity as an accident of history is seen as crucial by the authors to the formation of Popper’s political outlook in the Open Society. This political outlook is blatantly liberal in its egalitarianism, humanist in its universalism, pluralist, anti-nationalist, anti-xenophobic and self-consciously and very deliberately pro-cosmopolitan: ‘…Popper did self-consciously identify himself as a cosmopolitan liberal, exiled against his wishes, resolutely committed to fighting fascism with philosophy quite explicitly and anti-Semitism implicitly (not because he saw himself as Jewish but because he saw anti-Semitism as a form of racism, which he abhorred and wanted to annihilate).’ (82). How did Popper’s egalitarian and universalist outlook compare to Strauss’s overt elitism and authoritarianism? The puzzle about having Strauss in the book is clear. Strauss is a misfit for the book. Strauss subliminally imbibed Nietzsche’s elitism through Heidegger’s nurturing of Strauss when still an immature scholar. Hold on — is Strauss indeed a misfit for the book? I think not, and I explain below. There is a strange attitude that developed among Western European and also American Jews, who wanted to become assimilated Germans or Americans or French or Austro-Hungarians, and so forth, that has been studied by the Jewish cultural anthropologist, Ivan Kalmar (1993). Kalmar created an acronym for Jews who seek to be assimilated, or at the least, not stereotyped with the label ‘Jew’ and the implicitly anti-Semitic, often unconsciously held Judeo-phobia, by the majority populations in the Jewish diaspora: ‘‘EJI’, an acronym for ‘Embarrassed Jewish Individual’. Pronounce it ‘edgy’ for edginess and embarrassment about being Jewish are among the chief symptoms of the cultural condition I am speaking of.’ (8) This attitude may explain both Popper’s intellectually aggressive cosmopolitanism and anti-Zionism on one side, and Popper’s intellectually fierce anti-racism, and anti-illiberalism, and more so his, adamant critical attitude to all who cross the line of intellectual dishonesty, as he sees it, on the other side. Here ironically, Leo Strauss, who was as adamant about the hidden truths in the classic works of the ancient Greeks such as Plato, as Popper was adamant about universal critical rationality that one must ruthlessly apply not only to the classics of the Greek philosophers, but to all who claimed the title of ‘philosopher’, whether Hegel, or Marx, or Wittgenstein, or Carnap, or one’s own former students. Strauss, though he grew up in an observant Jewish family, was as EJI as Popper—and rode the high intellectual horse, rough riding over all who crossed whatever invisible, inarticulated intellectual line, as a concealment of his EJI attitude. The above I take as an implicit corollary of the main thesis of the Jewish Exiles book: the intellectual history of philosophy is a form of philosophy, and philosophical ideas are important factors in history. In the very concise words of the authors: ‘…we are convinced that even if one tries to do intellectual history for its own sake, one cannot avoid philosophising in disguise. Our four exiles seemed to think so and we see no reason to insist otherwise.’ (18) Hence, though unstated in the book: Both Popper and Strauss are quick to the draw on their high intellectual horses when they spot whomever they see as a sloppy and self-satisfied intellectual or philosopher—even friend or former student—because they both thought that ideas are important factors in history and can mean death for millions. I end here on that important note that hidden in this book is the strange thesis of Strauss and Popper, not as intellectual enemies, but as mirror images of each other. They are EJI Jewish thinkers who attempted to establish their intellectual credentials in a world that they saw as hostile to intellectually tough thinkers—aggressively honest not merely intellectually, but also and more importantly in their own eyes, morally. Kalmar, Ivan 1993 The Trotskys, Freuds, and Woody Allens: Portrait Of A Culture Toronto: Viking.